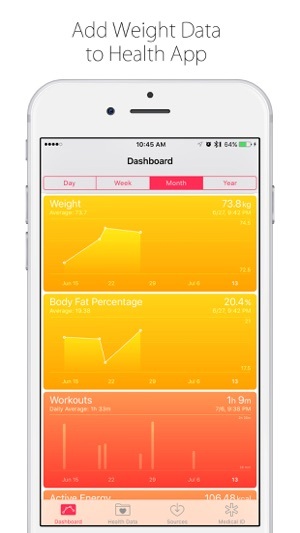 App store(Japan) "Healthcare&Fitness category Rank.6"
App store(United Kingdom) "Healthcare&Fitness category Rank.11"
App store(Italia) "Healthcare&Fitness category Rank.10"
App store(Indonesia) "Healthcare&Fitness category Rank.7"
Weight+ can register Body mass data Point to Health app for Apple Watch. ※Apple Watch supported by later than iPhone5 models.Previous models than iPhone4S (Including iPod touch) is not able to use Apple Watch. The Body Fat Percentage works just fine. The Weight selection only lets you select between 96 and 125.9 for some reason. 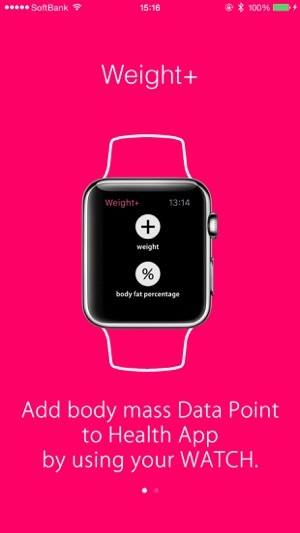 If you weigh between 96 and 125.9 pounds, you'll have no trouble using and saving your data. The weight range should be set for the most that someone could possibly weigh, to allow for everybody's use of the app. Maybe even allow input of a lower limit for someone who might be tracking an infants weight. Anyhow, I'm hoping this is fixed soon. As for the IPhone app... Well lets just say stick to the  Watch app. If you want to contend on this platform I would suggest cleaning up the UI and polish the look. Again this doesn’t matter to me due to my wanting the ability to enter wieght using my  watch so this does not deter me at all. iPhone design and you will see this app climb the health charts! Dev: you have a bullseye on your back now... Stay in front of the pack by listening to feedback and updating. 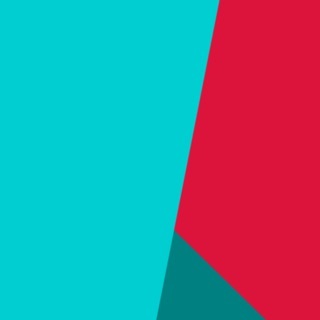 It’s without a doubt worth .99 and I would pay up to 2.99 for a polished excellent UI performance based app so hats off to you jumping in front of the pack! FYI: Incorporate “force touch” ie changing measurement (lbs etc) or view avg. Weight instead of going to health kit. Just a few ideas. This will be your longest review for a weight tracking app no doubt. Just goes to show you this will fill a niche! Update: Glad to see constant updates! Loading times on the  Watch are almost none existent (Well done dev)! 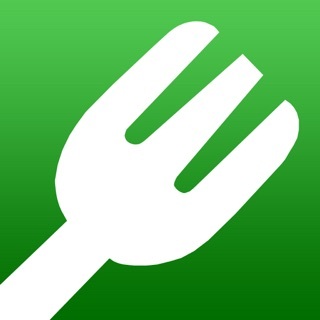 I use this app daily and it has found a home on my ios device(s) as well as in my daily routine! How many apps can you say do that!? Since purchasing this app I have never been let down! Updates continue to come and it is the app that I use every single day on my  watch! No need to had a complication on the watch face as the realestate is limited but I would recommend this app to anyone who cares about their health and owns an  Watch! What happen!? Last update has deemed this app useless!!! Dev you have an app that has a place on everyone's  Watch!? PLEASE FIX!! Requires iOS 8.2 or later. Compatible with iPhone and iPod touch.